Could you resist the urge to help Ruby? We invite everyone to watch this video on “What is Montessori?” to kick off the start of Montessori week at Tall Pines School. Occasionally, there are incidents in our parking lot which provoke concern about the safety and security of our students and their family members. We would like, therefore, to let you all know again, about the norms of behaviour in the parking lot, norms which we use to endeavour to keep everyone safe. As you know pedestrians (children and adults), are in close proximity to vehicles which are moving in and out of parking spaces. Pedestrians are vulnerable, and children, because of their size and levels of activity, are more vulnerable than adults. Here at Tall Pines School, we take very seriously our commitment to ensuring the safety of our students, and to that end, we require that all adults driving vehicles on our property to adhere to our safety guidelines. 1. Large vehicles, such as SUV’s, vans and pickup trucks MUST be vigilant, avoid reversing where possible, and when possible, park in the south part of the lot adjacent to the Gym. 2. Designated parking areas are for those specified on the signs. 3. Whenever you and your children are walking to the school entrance, where possible, please use the pedestrian pathways, marked with cross hatching. 4. Families with older children, grades 4 and up, should use the Kiss and Ride student pickup and drop off service, using the driveway around the building, instead of parking in the lot. 5. Children are not permitted to be in the parking lot unescorted by an adult. Unaccompanied children are to remain in the school until an authorized adult comes to collect them. 6. Children must be under your direct supervision while in the parking lot. Holding hands is a great idea. Please do not get into distracting conversations with friends – free range children are not safe in the parking area. 7. When walking, please endeavour to make eye contact with the drivers of vehicles that are moving, or are about to move. This way, you are sure that they see you. 8. CELL PHONES are NOT to be used while your car is in motion. Should we see drivers using cell phones, they will be reported using Road Watch. 9. NEVER leave a small child in your vehicle, unattended. As a school, it is our due diligence to report incidents of this nature to the authorities. 10. Please DRIVE SLOWLY and be aware of your surroundings at all times. 11. Kiss & Ride Gate is open from 8:25 a.m. - 8:50 a.m. for drop off and is open from 3:30 p.m. – 4:00 p.m. for pick up. Casa 1, 2 and 3 drop off is in the back playground; the parking gate opens at 8:25 a.m. and closes at 8:50 a.m. with the drop off time at the playground gate starting at 8:30 a.m.
Parents are to use the ‘Kiss and Ride’ along the back. You need to bring your child to the playground gate and say a quick goodbye and then proceed back to your car. If you are dropping off a child in Grade 1 to 8, you join the ‘Kiss and Ride’ line or park in the front and walk your older child into the building. If you arrive after 8:50 a.m., you must park at the front, walk into the front office, sign out a key fob, then walk through to the playground and then return the key fob before exiting the building. There will be a system in place for notification in the chance the teachers are not outside for the morning drop off. A red flag will be placed near the front gate so parents know that the children are to be picked up in the classrooms. On such days, parents are to park in the front parking lot and walk their child into the school, saying their farewells at the classroom door. Casa 1, 2 and 3 pick up is at the front playground at 3:45 p.m. Parents are to park in the front parking lot and pick up their child at the gate. If there is inclement weather, the pick up will be at the classroom door. Any child not picked up in time will be signed into Extended Care, which will incur an extra cost. Procedures for Casa 4 and 5 are the same as for Casa 1, 2 and 3 except: Casa 4 and 5 drop off is at the front playground and pick up is from the back playground. We thank you for your patience with this new procedure, and we thank everyone for ensuring that all of our children remain safe and secure while entering or existing the school. My husband and I, wanted to take a moment to say “thank you” and yet that does not seem like a strong enough statement. I am not sure that we, as young adults, took the time to realize the importance of our teachers in our everyday lives. And yet, now as parents, we see how they have a direct impact on our children's growth. As I look back,now I distinctly remember the names of those teachers who helped me grow, taught me to laugh at myself and helped me see the potential in myself. As parents, we have seen our children grow up in the wonderful world of Tall Pines. We have seen them develop into individuals who have an appreciation for their community and acquire a curiousness about WHY things are the way they are. We have seen both Matteo and Emilio open their minds to possibilities, to challenges and question the status quo. As parents, knowing that we could bring our children to a school everyday into an environment where their values were based on integrity; the nurturing of a community; the focus on learning; the strive for excellence; and the learning of the social aspects of respect to others being just as important as to respect themselves. These all being an extension of the same beliefs practiced at our home. My husband and I wanted to thank each one of you that have been involved in encouraging, mentoring, influencing and teaching our children. Your kindness. Your empathy. Your patience. Your care and your concern have not gone unnoticed. Both Matteo and Emilio will remember that you took the time to listen. That you stopped to ask them how they were. They'll remember the laugher. They'll remember the experiences and they too will remember the teachers that helped them grow and tap into their potential! At the end of the day, what has mattered is each of YOU from Casa to the Zone. Thank you for being a part of our children’s lives in helping them grow as individuals. Thank you, we will miss you guys!! Yesterday our school ran a Track and Field Meet at Chinguacousy Park for the SSAF. Over 650 students attended from schools all over the GTA. It was a great day, not only for our students, but for all the students who attended. 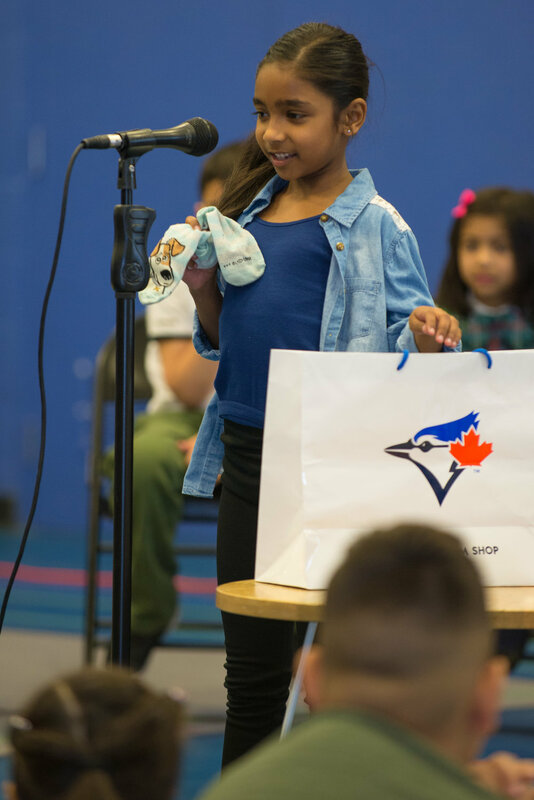 Today was our Grades 1-3 Poetry Presentations in the gym. The students presenting were chosen by their peers after presenting in their class. It is always an amazing experience to see these wonderful students perform a poem they have memorized. Thank you to all of the parents who were able to come out to our Montessori "Let Me Show You", on Saturday. Our parents were 'wowed' and inspired by their children. Our students presented Montessori materials to their parents and showed them what they have been working on in the classroom.